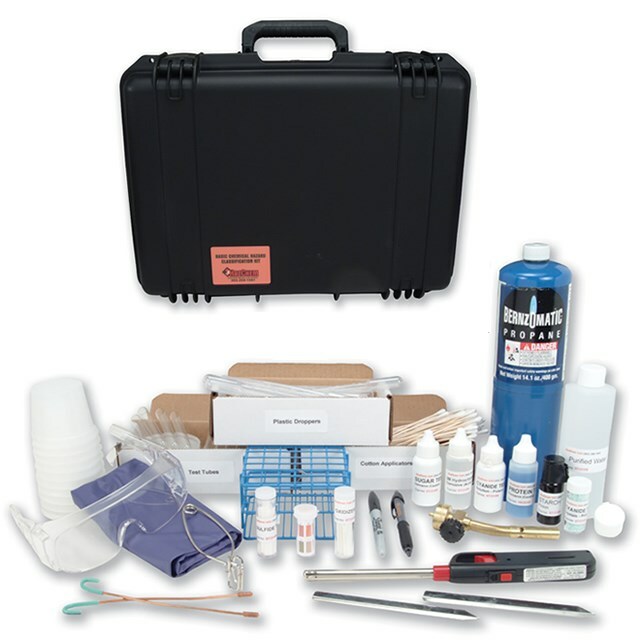 The HazClass® Kit 1 is a hazardous materials test kit designed to provide first responders a rapid and easy method to determine if unknown or suspicious materials present a possible chemical, radiological or biological hazard to the responder, population or surrounding environment. The procedure is not designed to identify the chemical, but to determine if a possible hazard may exist. The HazClass® Kit 1 maybe used by any personnel with basic HazMat training skills. The HazClass® Kit 1 can be used in any situation where hazardous materials may be of concern. The HazClass® Kit 1 can be used for the determination of EPA-RCRA Characteristic Hazardous wastes which are Ignitability, Corrosivity and Reactivity. The HazClass® Kit will help in the determination of certain DOT classes, material compatibilities, and labeling for transportation and disposal.